Having your house tented is a major disruption. A Huge Pain in the ... Tail. We first had to schedule the operation. This is such a "popular" thing here that the better companies are booked months in advance. Oddly enough that worked in very well with what we had to go through. I bake, a lot. We both cook large meals and keep frozen leftovers. The cupboard is full of things like baking soda, and mixes that are somewhat less common. A Spice Cabinet with things like Cumin, Curry, and Vanilla Bean that actually get used. I tell people that I have a spice cabinet and I know how to use it. I buy Cinnamon by the "large jar", as well as certain other spices. It can be an obsession but my neighbors like it when ever I get a bit out of control and start baking. All of that had to be drawn down. The freezer needed to be "minimized" as well. The freezer was so crammed full of food that even in the hurricane season it was difficult to manoeuvre in there. There was a silver lining in this whole process. When asked when we would want to have the house tented, we were told it would be three days. Either over a weekend or starting on a Monday. The Weekend Tentings were not as popular since we could get one sooner. We were speaking to them in August, the next weekend tenting was in October. That would give us two months to empty the freezer as much as possible. The problem with Weekend Tenting here is that we have people who are going to the shopping center with the bar that is close to the house. I had this mental image of coming back to the house after some drunk climbed under the tent after thinking mistakenly that they can hold their nose and be safe. We went with a weekday Monday tenting as a result. That could not happen until the Monday before Thanksgiving. For three months we were purposely eating everything we could that was "back stock" in the refrigerator and freezer. I was baking to draw down supplies as much as possible. I managed to use up 20 pounds of flour in two months. The instructions were straightforward. If it goes in you it gets bagged in a giant Nylon bag. That bag would get bagged inside of another bag. Each bag gets separately zip tied shut. This was true for anything in the cupboard - so there went my spices. It was true in the freezer and the refrigerator. If it is sealed in a can or sealed in a jar it can stay out, but plastic bags and bowls go in the bag. 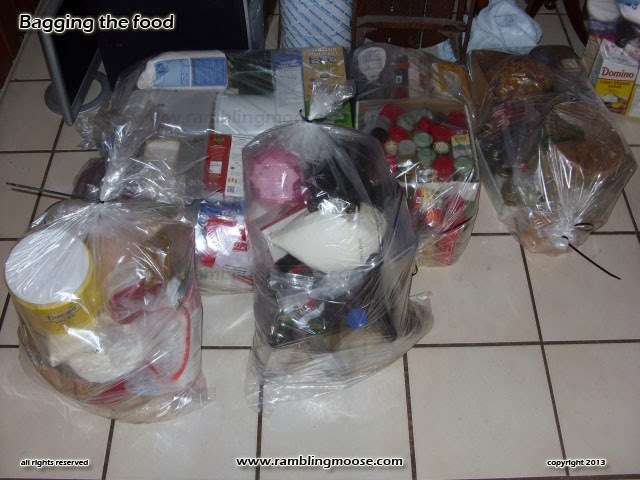 By the end of the bagging, my refrigerator had two bags, the freezer had one. 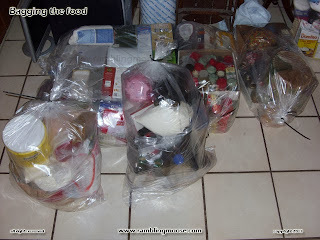 There was a mountain of bags in the dining room of food that would not be harmed by being out of the cupboard. The pet food would either have to be bagged or taken with us. Anything that was the dog's had to leave the house. After all, Rack's sense of smell was much better than ours was. So dutifully, I began putting Rack's toys in a box to take with us when we would de-camp to another place. The box being on the floor was an invitation for him to take his favorite toy out of the box and play with it again. This went on for a while until I picked the box up and placed it high and out of his reach. No, Rack, you may not play with that now. Pouty dog aside, Oscar the Parrot was easier. His toys are bolted onto the cage and the food all went into one giant bag save a little for the three day trip to the BnB. A solid weekend plus worth of packing food, dog gear, parrot food, and people's clothes resulted in a disrupted house full of things "staged" to go. Finally, electronics and other valuables had to be triaged and staged. I had to make sure that I could do whatever it is that I do with my computers while gone. The computers I have are all older and I use them differently than most. Since data is put on the machine that it is most needed, it is spread around. There isn't a computer in the house that is newer than a year old, and most are what others would think are underpowered. That's a benefit since underpowered means cheap and in some cases free since they are "cast off" or even throwaway machines getting a second life. But since there are more than one, I can spread the load around. There would be a long block of time that workers would have access to the house but we would not. Luckily we had honest workers. I've heard horror stories about that sort of thing down here in South Florida. You've got to watch people while they're working these days. We even went so far as to take pictures of anything and everything in the house. While it turned out to be overkill, it is a great inventory in case of a break-in and well worth the couple of megs worth of picture files we both have floating around. After all of this obsession and prep work, we were ready.